The Solstice is upon us. The sun has reached its highest point and we feel drawn out into its heat after weeks of warm one day, cold and rainy the next, northwest weather. Nature is finally flourishing and our senses are receiving quite the treat. We gathered once more with friends this quarter turn to celebrate a gorgeous change of season. We began our Midsummer celebration with a few hours spent dying play silks on camp stoves in the garden. (Sadly I have no photos of the actual process since my camera battery died just as we began our festivities and I had to wait a few hours for it to recharge.) The dying was surprisingly simple. We had purchased acid dyes but decided we wanted the children to be a part of the process so switched to the artificial drink option some of us had read about online. We pre-soaked in a vinegar and hot water bath then swirled the silks for 10 minutes in heated pots of KoolAid and hot water (about 3 packets per silk). We were all somewhat repulsed by the sticky sweet odor emanating from the concoctions but happily surprised at the simplicity of the process and the soft beauty of the end products. With the silks waving in the afternoon breeze, the children just frolicked happily in the yard until a surprise visitor emerged from the shrubbery! Green Man crept out from the bushes to gather the young ones around him. He held their rapt attention as he spoke a beautiful poem and gifted each child with a crown and wand. "With these crowns and wands, I knight you all princes and princesses of the Summer. Together we'll hold the sun in our hearts to light the world all year long..."
Such an extraordinary afternoon with all the wonders of the season received as gifts from the earth. Before we parted we each took a stone to the fire. Holding it to our hearts, we made a wish and walked around the burning wood three times before tossing the pebble into the flames. It was a simple but perfect afternoon organized with loving detail by an amazing village of adults for the imaginative, wonder-filled world of our children. Actually, I believe the wonder was enjoyed by all. Many thanks to our gracious hosts and to all who joined us to make this such a meaningful and memorable festival. The fairies came and must indeed have danced all night and held quite a festival! When we woke in the morning we found not only a precious gift from the Queen but some pretty festive new decor in their garden. We think these must be some kind of magical lamp (although they look interestingly like dried poppy pods). We also discovered some sweet fairie-sized paper party hats. All the cakes and cookies we had made the evening prior must have been gratefully gobbled up in the night. Not a crumb remained. Midsummer's Eve and its related holidays are celebrated at various times by different groups of people around the world. Each year it falls somewhere between June 20th and 25th as do the festivals of Summer Solstice and St. John's Tide or the feast of St. John the Baptist. This time of year is one of breathing out, of inner and outer expansiveness. The structure of school is set aside and the crops (large scale or small) have mostly been planted. It is a time to relax and let go. Traditionally midsummer bonfires are lit wherein the "sun substance" in tree wood is released to become fire again. On the day of the Solstice, we gather with friends, build a great fire, eat, dance, sing, create and play in the glorious sun. Before that day of frolicking though, our family enjoys a quiet afternoon and evening preparing and offering gratitude for the goodness we enjoy year round. Midsummer for us is a time to honor the elemental spirits of the earth. In our home we talk about them as fairies and gnomes and traditionally this is a night of great festivities in their world. To offer them thanks for all that they do to help the processes that sustain our lives, we mark this occasion by baking them special little sweets for their all-night celebrations. This year we found these tiny cookie cutters and baked and decorated mini cookies and cakes to leave for them in their garden. We made so many we had to add an extra buffet table. Naiya also wanted to leave a bowl of slightly more nutritious raisins to sustain them through the night. We were eating oranges this morning which inspired Naiya to tell me about her favorite fruits. "My favorite fruit is split between watermelon, rainiers (cherries) and oranges," she tells me. "What about cherimoyas?" I ask conversationally (because those were her favorite fruit last week). "GOODNESS SAKE MOM!" she gleefully exclaims in a tone so intense I am startled. "You broke my discoverment!! I love cherimoyas!" We have some upcoming summer trips planned and, as usual, I want to bring along a few crafts for kids. Last year I discovered a number of ideas using both store bought items that we could bring into the outdoors and bits and pieces of Mother Nature herself. 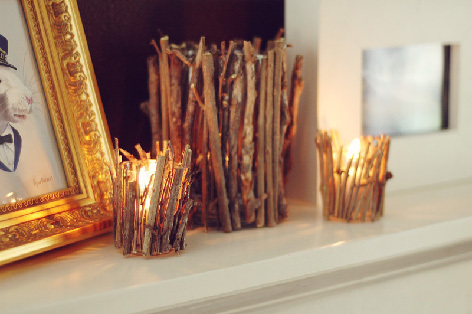 (See last year's camping crafts here.) I've been scouring the internet once again and discovered some more really creative folks out there! Since the attention span of five year olds can be limited, sometimes with crafting, simplest is best. 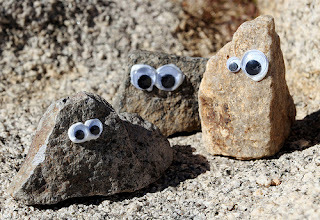 Megan over at Radmegan posted this classic Rock Friend idea with a reminder to take these little guys home when you're done because... "do you really want to be the camper who takes only photos, and leaves only footprints... AND eyeballs?... They will be a great reminder of your fun camping trip, and a fun addition to the household." Over at Homemaking Fun, Jadi had this idea for painting leaves, flowers, roots and stems that can then be transferred onto t-shirts or pillow cases. 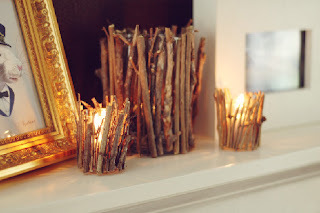 Here's another great use from the Fossil Blog for all the twigs children are happy to collect. Again, hot glue could work here or one could probably more easily pack a multi-purpose craft adhesive for wood and glass. Take a little paint along on a camping trip, find a bigger stick and you could make some gorgeous walking sticks for daily hikes as well! 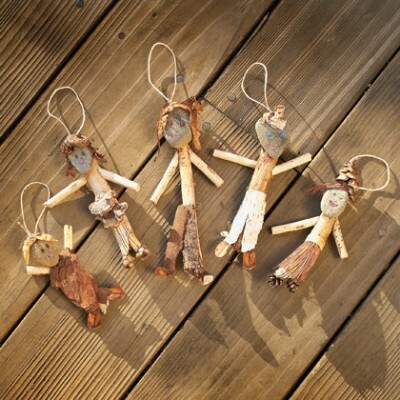 Do you make crafts in the great outdoors? I'd love to hear more ideas from you! On one of our recent Nature Walks, we brought home a giant basketful of twigs. We had it in mind to make a little something for the fairies living in our garden. Onto the frame we attached more twigery (yes, I totally just made up that word) along the back of our chair and then laid slats across to form the seat. Naiya decided it was a grand throne for our Fairy Queen and we placed it in her garden. I think she will be ever so pleased. Back in 1917, inspired by Georgiana Burton Pittock and 20 miles of rose-bordered streets, Jesse A. Curry (a former Rose Society president) convinced city fathers to inaugurate a rose test garden. What is now the oldest official, continuously operated public rose test garden in the United States was born. We go mostly for the smelling. But its a great sensory experience all around. Sadly, this morning we found that during the night, our dear Juniper had been taken from the coop by a raccoon. We've had her for three and a half years. I'm not sure how to feel about this loss. May our little friend rest in peace. My strange blog moniker is also the handle our family uses when we're out Letterboxing. Now, for over a year, our little band of seekers has been somewhat untrue to letterboxing tradition and we've been leaving imprints of a store bought stamp in the logbooks we've hunted and found. (Purists are no doubt shuddering.) 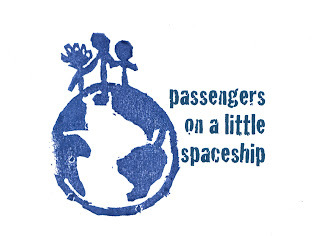 With a new seeking season starting up, however, we've finally come up with an image to suit our odd epithet and decided to try our hands at carving our first letterbox stamp. Most of the stamps we've come across have been made from erasers and since I found a giant one of those at our local craft store and we happen to already own a set of wood carving tools, I drew out our image and Ryan volunteered to take up the carving. Using his various sharp (and heretofore unused) wood carving tools, Ryan carefully cut away all the negative space around the drawing. After a year of fretting over the difficulty of this undertaking, we (or should I say he) found it surprisingly simple in the end. I'm not sure we've got all those continents exactly right and Naiya's curls might look more like a crown but, finally, we're the proud new owners of our first hand carved letterbox stamp.